As Italy commemorates the anniversary of the death of the first Roman Emperor, Augustus, in 14AD, in the first part of an ongoing series, Carol King investigates what the Romans ate. 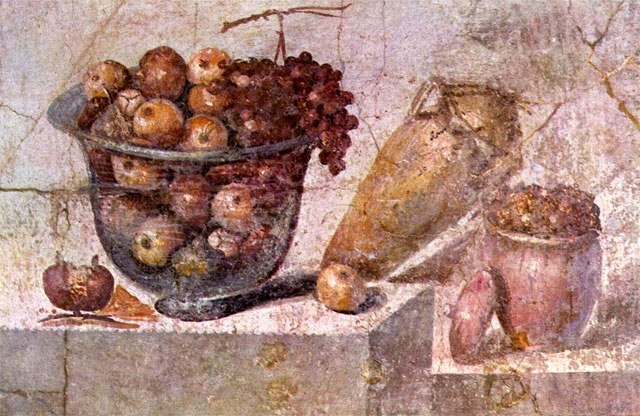 Historians and archaeologists have been able to build a picture of what the Ancient Romans ate thanks to artefacts uncovered at historical sites and on digs, and through the ancients’ writings and artworks like mosaics and frescoes. At its peak, the Roman Empire stretched across Western Europe to Britain to the Middle East and south to Northern Africa and the Sahara. 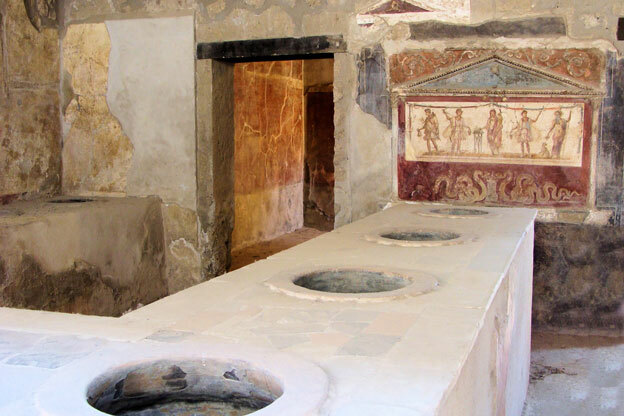 Consequently, many Ancient Romans did not actually come from Rome and their diet varied according to where they lived. However, the Romans did take various favourite foods with them, even to the most far-flung provinces, introducing items like walnuts, onions and cabbages to Iron Age Britain for example. The Romans had a varied diet. Vegetables eaten included carrots, radishes, leeks, lettuce, endive, celery, cabbage, pumpkin, asparagus and mushrooms, as well as nuts and legumes. Among the fruits commonly consumed were grapes, figs, apricots, pomegranates, dates, apples, quinces, plums and pears. The Romans ate different meats including lamb, pork, beef, venison, wild boar, chicken, goose, duck and guinea fowl. In rural areas, people prepared cured meats like ham and bacon. Fish like tuna, salmon and mullet, as well as shellfish including mussels, crab, sea urchins, oysters, squid and cuttlefish, were also popular. However, food was basic for ordinary Romans, wherever they were. The staple diet was pottage, a cereal-based dish like porridge made from wheat, corn or millet. Sometimes, herbs, honey, eggs or cheese were added. If people were lucky enough to own a goat, cow, geese or chickens they might add meat or offal to the stew-like pottage. The poor are thought to have sat on chairs to eat. 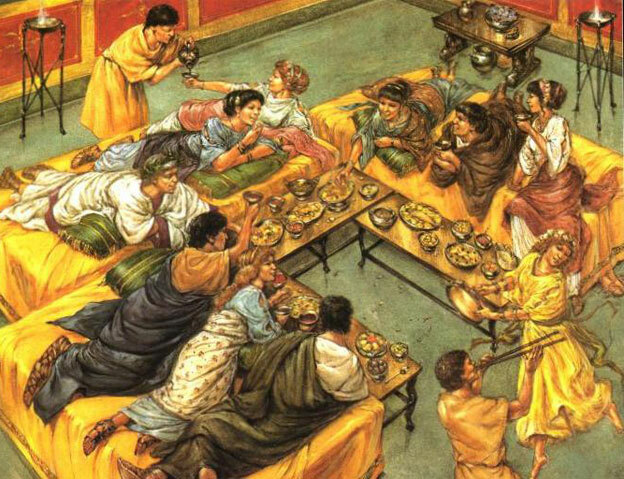 Affluent Romans had a more sophisticated diet that took in jentaculum (breakfast), prandium (lunch) and cena (dinner). Breakfast was eaten early morning and consisted of milk or watered-down wine with salted bread, pancakes, eggs, cheese, honey or dried fruit. Lunchtime was near noon and comprised of bread and fish or meat with vegetables. The main meal of the day was dinner, which was eaten late afternoon or early evening and could last from one to four hours. Dinner could consist of wine, fish or meat with vegetables. As today, courses were customary in an effort to promote good digestion. Olives, small sausages, hard-boiled eggs and salad dishes eaten as gustationes (appetisers), followed by meat and fish dishes. Meals were often rounded off with cheese or fruit like grapes and figs. Sometimes, there would be a dessert of small cakes with honey. Few homes had ovens and food was cooked on iron braziers using charcoal, meaning that meat and fish were usually boiled or fried in olive oil rather than roasted. Most of the time, the Romans ate with their fingers. However, the wealthier Romans used knives and spoons made from bronze, wood, silver and bone. In the summer, people often ate outside. Banquets were extravagant affairs designed to show off the host’s wealth to his guests and they often lasted for several hours. Slaves served up exotic meats like roast peacock, flamingo tongue or pheasant brains on silver or bronze plates to guests who reclined on cushioned wooden couches. Any detritus was cast on to the floor to be swept up by slaves, although guests were permitted to take leftovers home in doggy bags like napkins. Plenty of wine would be available, along with water and sweet drinks like mulsum made from a mixture of honey and boiled wine. The elite would be entertained while they dined by acrobats, singers and, occasionally, dancers. Dishes were imaginative and cooks used herbs and spices, such as cinnamon and saffron, to add flavour. The Romans appeared to eat almost anything, including delicacies like baked dormice consisting of dormice stuffed with minced pork, dormice meat, herbs, pepper and pine nuts. Sauces using vinegar, honey, pepper, herbs and spices were also popular. One especial favourite was garum, which is a strong tasting, fishy custard made from fish fermented in salt water.